Local Listings: Which Ones Should I Focus On? It’s common knowledge that your business website is the best place to get customers to go when they’re online. And if you’re a local business with a physical address, a lot of your website traffic may come from maps listings. 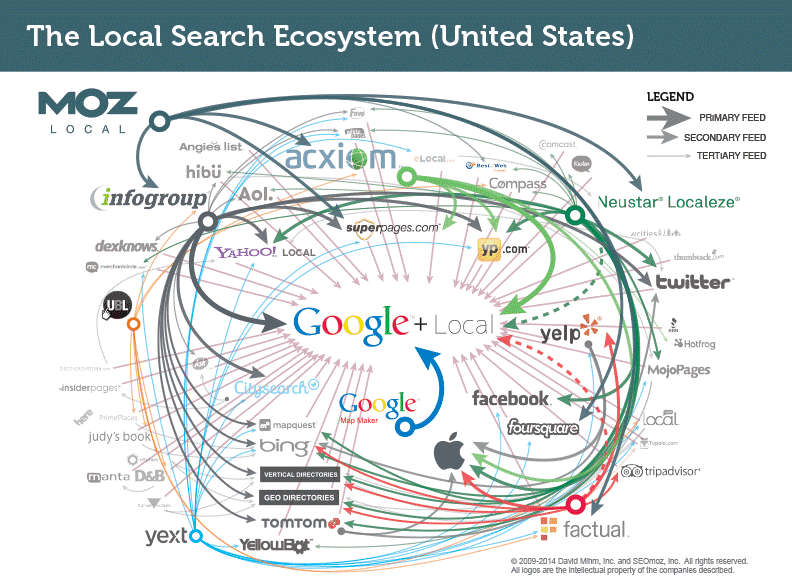 Optimizing for local search results is called local SEO. If you’ve been in business for any period of time in the last decade, you’ve probably already heard of it. Local SEO is super important, everyone says so. Everyone’s got charts and graphs and statistics telling you how important it is. And they’re not wrong. It is important. And with a recent revelation Google’s algorithm for Maps search results has been updated, it’s more important than ever to make sure you’ve got your business name, address, and phone (NAP) information up to date and consistent on the Internet. The good news is that you can list your business on a vast majority of listing sites for free. Just follow the steps to input your business info and within a certain turnaround time, your business will be listed. The challenge is that between major data aggregators and tiny upstart listing sites, there are way too many places to get your business’ NAP info listed. Where do you even start? Luckily, there are a handful of listings on big data aggregators’ platforms that will actually feed the rest of the little ones. You can save yourself a lot of time and trouble if you just go for the major sources. Trying to fill out your information for every single little one would be far too time-consuming. Note: before getting started, it’s important to remember to enter your information exactly the same way each time. Because of Google’s size and influence, they are a natural target for phonies and spammers. As such, they go to great lengths to ensure that every business listed is a legitimate business with a legitimate address. That means their process is long and vexing. Go to their site, sign in (or sign up, if you don’t already have a Google account), follow the steps to get started. They’ll take you through finding the information that already exists on their map, and then to verify that you are the business owner and that your business really exists at that location, they will send a postcard in the mail. Yes, Google uses the actual US Postal Service. Click to send that postcard in the mail, and then you’re done until you receive it. You’ll get a PIN on that Postcard, which will arrive within a week or two. Then, once you have it, you’ll have to go back to the website and sign in again. It’ll ask for your verification PIN, and you can type in what’s on the postcard. Once you’ve done that, your listing is live, verified, and you can make edits as needed. Apple Maps has come a long way in the few short years since its initial launch. Once plagued by accuracy issues to the point of a public apology by Apple’s CEO, this is now the leading maps provider for Apple iOS apps. Its sheer reach makes it a must for any business with an address. You’ll need to set up an Apple ID if you haven’t already got one. Like Google, it’s free and easy. The steps to get your business info up are fairly straightforward. You’ll need to verify it with a phone call; once done, you can submit your business info. It should only take up to a week to get verified on Apple Maps Connect. Note: you or someone at your place of business must do this. You can’t outsource this task to an agency. Click here for additional details. Bing Places is Bing’s version of Google MyBusiness, and it actually predates Google MyBusiness — though its market share is, of course, still much smaller than Google’s. Regardless, this is a necessary source of NAP data for many websites, and as such, is a must-do for any local business. Once you’re logged in (again, free account), click to add a business and fill in your info. Like Google MyBusiness, you’ll need to receive a PIN by mail and come back to it. But, like Google MyBusiness, once you verify it, you’re good to go. To add a Facebook business listing, you can use your smartphone. Download the Facebook app if you haven’t already, and make sure you’re logged in. From the home feed, tap “Check In” — make sure you’ve got location services turned on. Use the search bar to type in your business name. If your business shows up, tap the three dots on the right to suggest edits. You can make sure all your info is correct. If it’s not there, you’ll have the option to add the new business. You can enter your info through that process. Many small businesses are afraid to touch Yelp for fear of being found and left a business-killing bad review. But Yelp exists whether you want it to or not, so take that bull by the horns and make it work for you! Start with a free business account, which is different from a regular (consumer) Yelp account. Once logged in, you can find your business if it’s already listed and begin the claim process by clicking the “Claim your business” button. Yelp will verify by calling the number already listed. The steps are easy to follow thereafter. If your business doesn’t exist on Yelp yet, you can search to find it and click “Add your business to Yelp” if it doesn’t appear. The modern form of the Yellow Pages is online at yellowpages.com, or yp.com. They’ll try hard to sell you ad space, but the listing is actually always free. Enter your phone number and business name, then an email address where you won’t mind getting tons of emails from yp.com; make sure it’s a real one, though, because they’ll need you to verify your listing there. Don’t worry — it won’t be published, and you can always unsubscribe from their marketing. Be careful with Acxiom — you can only do this once from your IP address. Make sure that you or someone at your business does this; don’t have an outside agency do it for you. Search for your business name and click “Claim My Listing” if it appears. If it doesn’t appear, you’ll need to create a new listing. As always, you’ll need to log in; create a free account if you haven’t done so. Here, you’ll have to actually upload a business document. The page will instruct you what types of documents are acceptable. They’ll all have the usual business info, and then some. After you upload the document, you will get an email to let you know once your business has been verified and claimed. The process is relatively straightforward for all of these — search for your business, click the available button to claim/manage the listing, follow their verification steps. Some require phone or email verification; they are simple, but you do have to pay attention. If you’re a real do-it-yourself type and are willing to go hunting for more directories on your own, great! The more the better. For maximum efficiency, you should look for the intersection of geography-based listings and industry-based listings – often this will be industry listings that are extremely well-organized by area, e.g. Zillow for real estate agents or ZocDoc for medical professionals. There’s actually a lot more that every local business would benefit from. But this takes huge amounts of time. Don’t have the time? Hire a professional SEO company that offers a “local listings” service. It’s not about your overall SEO strategy. Local listings are just one small part of SEO. It’s about consistency for your customers. Customers may encounter your business listing in multiple locations before they actually contact you. Inconsistency and confusion frighten customers away. Your contact info is typically the last thing they look at before contacting your business — accuracy and consistency are crucial. Time is the killer. If your time is more valuable than the cost of paying someone to get your listings in order, then do yourself a favor. Hire a professional team to do it for you. Get your listings consistent across the board, and get it done sooner rather than later. Custom Creatives is a full-service digital marketing agency specializing in small and medium businesses. If you’d like help with claiming listings and getting your business info consistent across the internet, call us at (818) 865-1267, or visit our website.